Indoor cricket team bowled out for ZERO! Three Bridges spinner Mike Rose said he ‘couldn’t quite believe it’ after his indoor cricket side bowled another team out for 0. Playing for Pharon League champions Christ Church University against Bapchild in the ECB county six-a-side indoor championships at Canterbury, Rose and his teammates smashed their opposition by 120 runs. Christ Church batted first and hit 120 before bowlers Fraser McWhinnie, who took 3-0 in 12 balls, including the hat-trick, and Philip Semmens, who took 3-0 in eight, struck. When they did hit the wall after the ball came off the batsman’s pads, the umpires did not allow the leg bye as they deemed no shot was played. Rose, who took 51 wickets for Bridges in division one of the Sussex Cricket League last season, said: “We all couldn’t really believe it to be honest, bowling a team out for 0, especially indoors as all they needed to do was hit a wall to get one run. And Rose had never been involved in anything like it beofre. 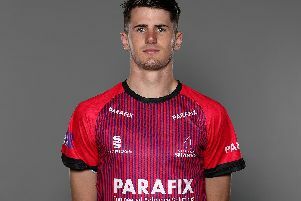 He said: “Indoors I think we bowled a team out for about 13 back with Three Bridges but I think it’s the first time it’s happened in history of the Kent league and maybe even indoor cricket. “But outdoors we have bowled teams out for less than 100, but certainly not 0!